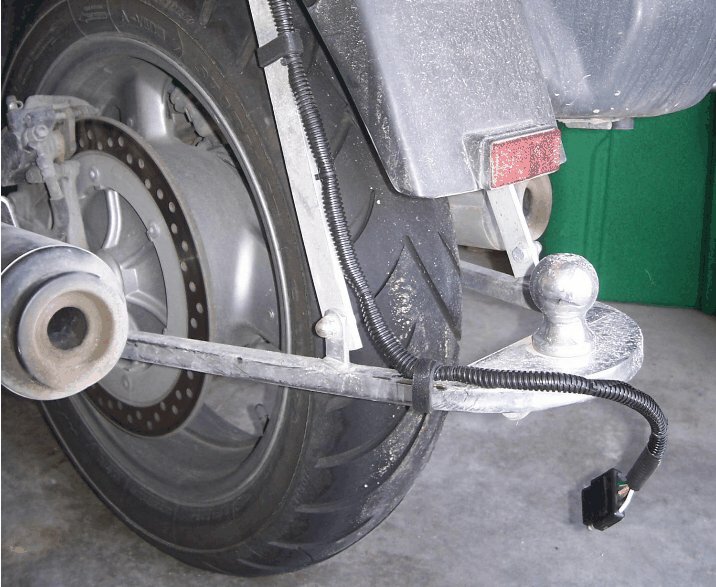 I have looked into the possibility of using an available Bushtec hitch but found out that the pin that is welded on does not have a ball adapter from Bushtec to use with the trailer I was looking at. So I had to pass on that one. Instead I did go ahead and buy a new hitch from Total Marketing Concept. The hitch arrived a week ago. This weekend I "tried" to install it. 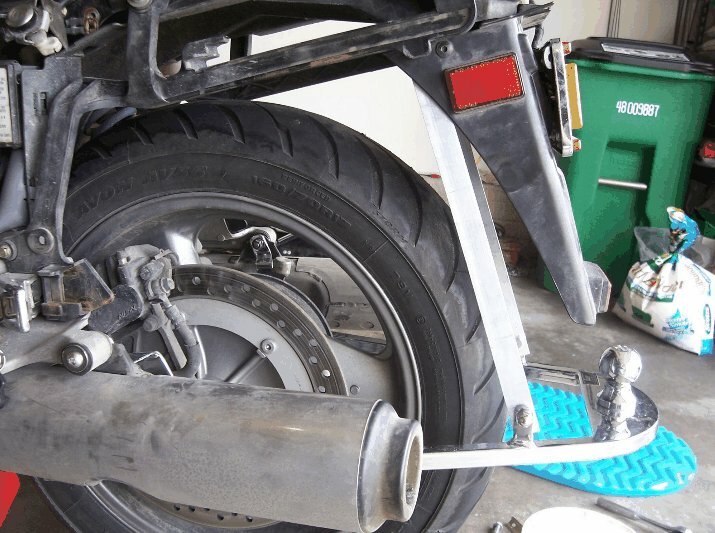 I found that the muffler bolts are not long enough to mount both the hitch and muffler. I removed one muffler mount bolt and tried the hitch mounting there but determined that I need to get longer bolts, by about 5 mm at least. The factory mount bolts are 50 mm long and have 1-2 threads showing (maybe 2 mm). 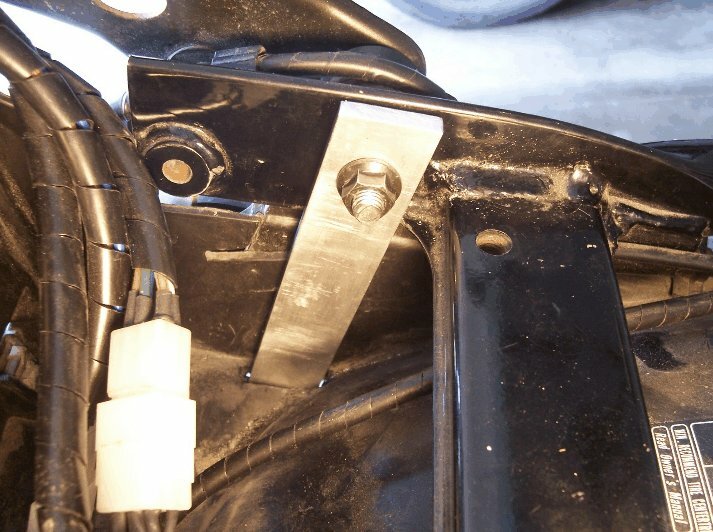 The hitch mounting bracket is a firm 5 mm thick. 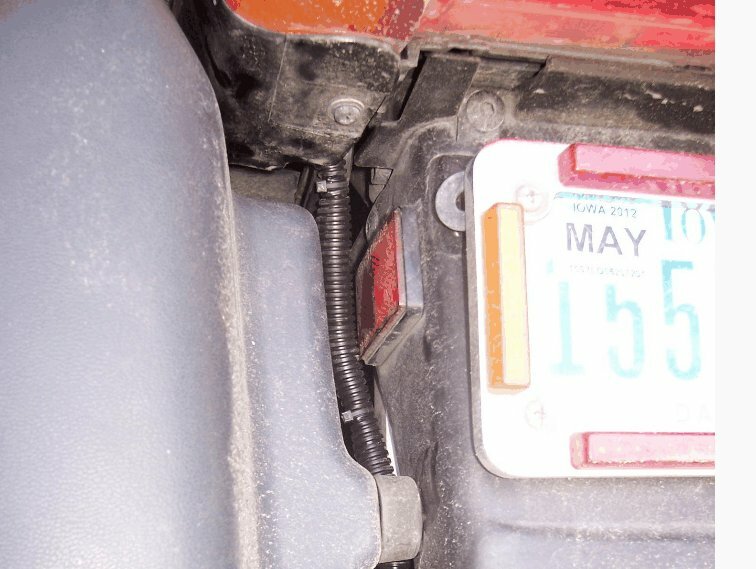 I was thinking of just leaving off the 2 mm thick factory washer on the outside of the mount but that is really needed to keep the rubber insert for the muffler mount from pulling through. The instructions that came with the hitch says to "Take off the rubber shim to install aluminum braces, put them back after installation." What rubber shim? I don't think this is the main hitch hoop since that is chrome (steel?) and the only obvious aluminum are the hangers. But then again, what rubber shim? I did find stainless 60mm x 8mm m-8 button head cap bolts to replace the stock hex head muffler bolts, which are 50mm x 8mm m-8 bolts. These I found at True Value. I received a reply from DenRay about the need for longer muffler mount bolts. They stated that they don't provide any bolts for mounting their hitches and that I should provide my own. Not real accommodating. And about that shim, they said some models of ST1100 did have a shim but if it's not there then ignore that step. Oh well, I already have the longer bolts and intended to ignore about the shim anyway. Planning to do the install this weekend. Sunny on Saturday but the bike will be getting the fork seals replaced that morning. Having the dealer do the work since I don't want to mess it up and don't have any special tools for that. Rain expected Sunday so this is a good weekend to do work on the bike. 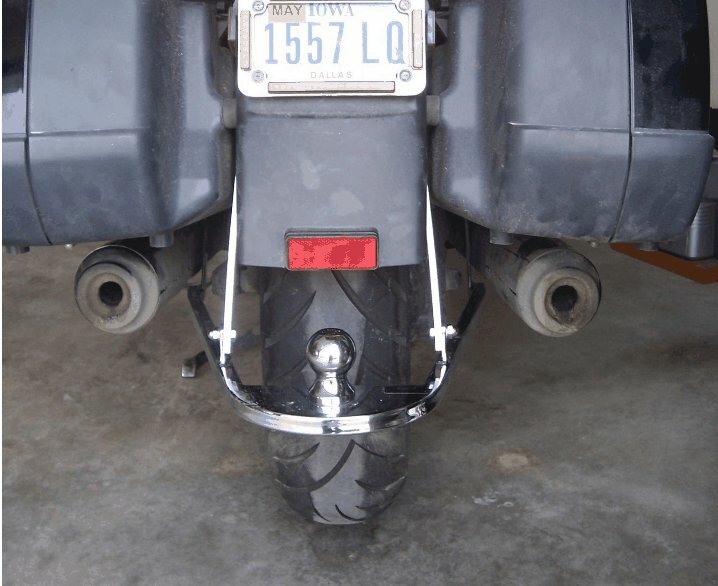 Now I know why every install photo of this hitch on this bike shows different hangers than what comes with the hitch. The mounting location for the factory supplied hangers indicated in the instructions, and indicated by the only location that they reach to, doesn't work since the boss sits in a recess on the back side of the slider frame. 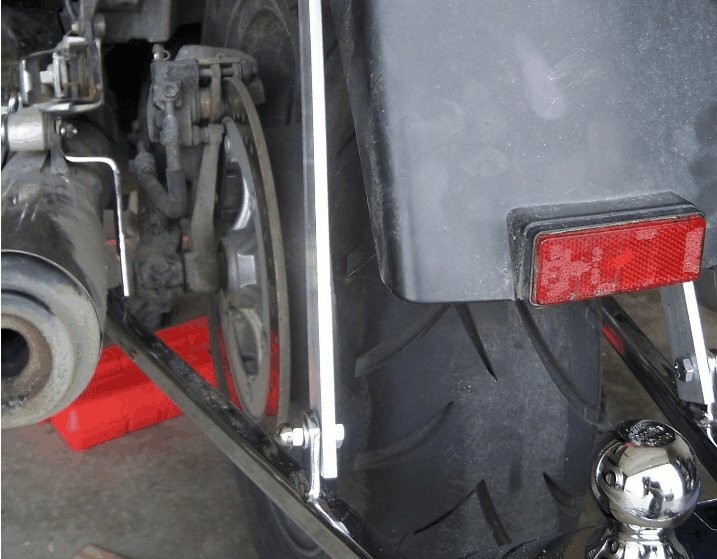 I tried installing to the outside of the saddlebag slider frame rather than the inside as stated in the instructions but that doesn't work either since they interfere with attaching the saddlebags. Since I really want to finish this weekend I will use the 1" x 1/4" thick aluminum bar stock I bought at Lowe's and fashion a longer hanger for each side to run to the inside of the rear sub-frame to the upper slider frame bolt going through a slot I will cut in the tool storage box area. Also need longer bolts again for that location so will be getting those tomorrow. I finally finished installing the Den-Ray hitch but had to replace a number of parts to make it work. I replaced the muffler mount bolts with longer ones (60mm instead of the stock 50mm). I also replaced the upper mounting bolts with the same. That's it for what I replaced on the bike and stored away the stock bolts for when/if I remove the hitch. I replaced the hangers supplied by Den-Ray since the factory hangers don't work. The top end would have to have a jog in it to fit into the recess in the back of the saddlebag slider frame where they said to install it. Not going to do that since that would shorten the hangers at least an inch and they seemed to be a bit short to begin with. I replaced those hangers with 1 inch x 1/4 inch aluminum hangers that I made. I first cut the slot in the bottom of the tool storage space under the seat and then fitted the new hanger through down to the hitch tab bolt hole. Marked the upper bolt hole and drilled that and cut off the top to the right length. Then marked the lower bolt hole and drilled it. Here is the top end and the slot. Here it is just before tightening all the bolts. The hangers I made drop the ball about 1-1/2 inch below what the Den-Ray hangers put it. Ended up better that way. It is more level now and at just the right hight for the trailer I intend to pull. Another view of the hanger. Finished side view with all the plastic and bags back on. And here is the rear view. Notice the hangers don't touch the saddlebags at all. I didn't need to put any definite bends in the hangers, though I did bow them in a little bit by holding the bar over both knees and pressing down on the very ends just enough to put a slight bow in the bar. Comments: Good write up, tho I'm not sure about the aluminum bars. I would replace them with steel. Steel rusts. And I don't have the funds or the means to coat steel with anti rust coating right now. The aluminum bar I used is 1/3 bigger (both wider and thicker) than what was provided and will be able to handle more than twice the tongue weight the hitch was designed for with the original hangers (50lbs). Though I agree steel would be stronger, it is not needed for this application IMHO. The aluminum is sufficient and more easily acquired. If I find any distortion in those hangers during use then I might consider the steel option. But I don't think they will be a problem. 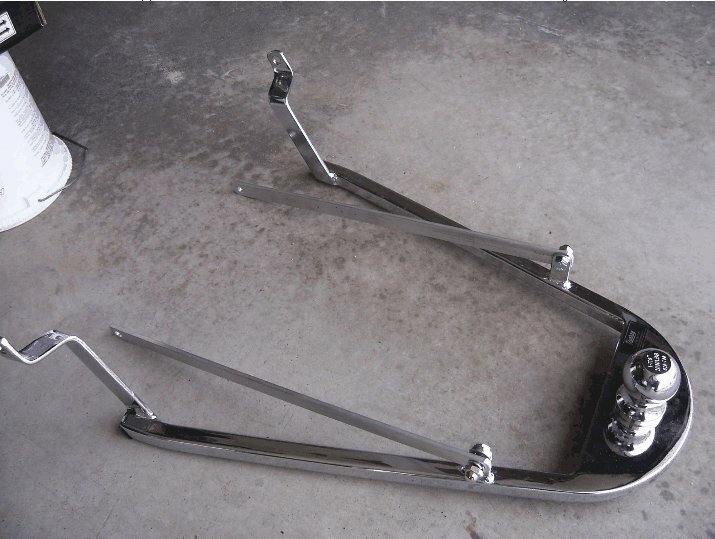 Besides, the primary mounting point at the muffler mount is to an Aluminum plate where the foot pegs also mount. 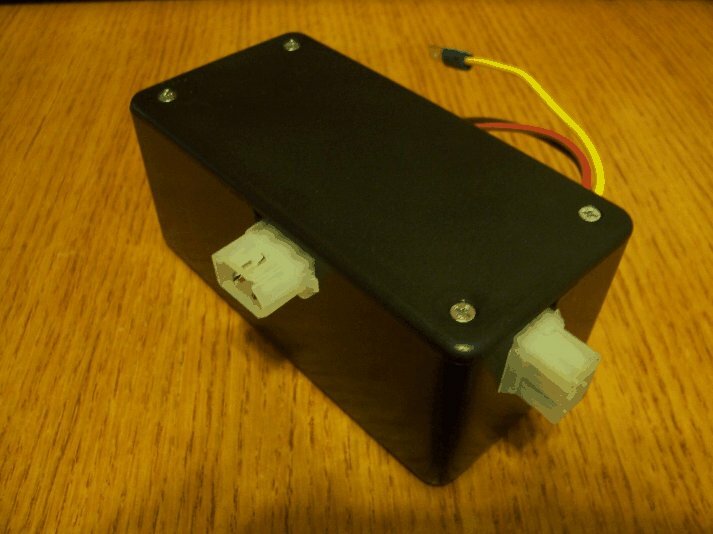 Here is the trailer lights relay box I made this week. I only use 3 relays since main power for it comes from my fused isolated power relay that is only on when the bike is on. Therefore I only need a relay for each turn signal and for the brakes. Running lights are on when the bike is on so just need to pass that power on through. I followed the diagram I posted in the Wiring diagram : Trailer Isolation Relay on ST 1300 with 2 exceptions. I decided to follow the color code indicated by the trailer plug harness, and I only used one main fuse dedicated to the this box. Oh, I also use solid green for ground as I do for all my wiring and therefore use a different color (red in this project) for the running lights. It would be nice to have a fuse for each powered wire on the trailer harness but I think that is more than is necessary. The one fuse will be enough and trailer wiring is not so hard to fix if there is a problem. 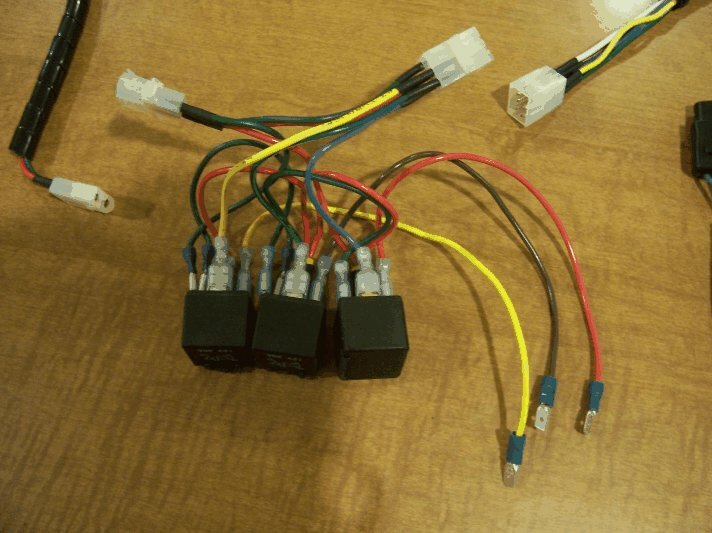 I like using standard automotive relays and Radio Shack connectors since the cost is very reasonable and almost all of what I do is located in a relatively sheltered place on the bike. The 6 pin connector on the right is for the trailer plug cable and can handle 12 amps per pin, though I doubt I will have any more than 3-4 amps at the most per pin. I used 5 pins and left one open. 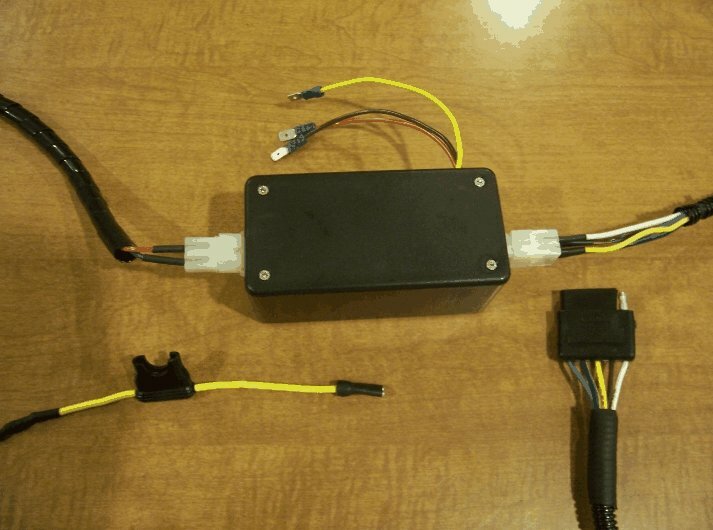 I am using a flat 5 pin Hoppy trailer connector harness. The 2 pin connector on the left is isolated fused power and ground and can handle 20 amps per pin. I have an in-line fuse holder that will have a 15 amp fuse at the other end of the power wire. 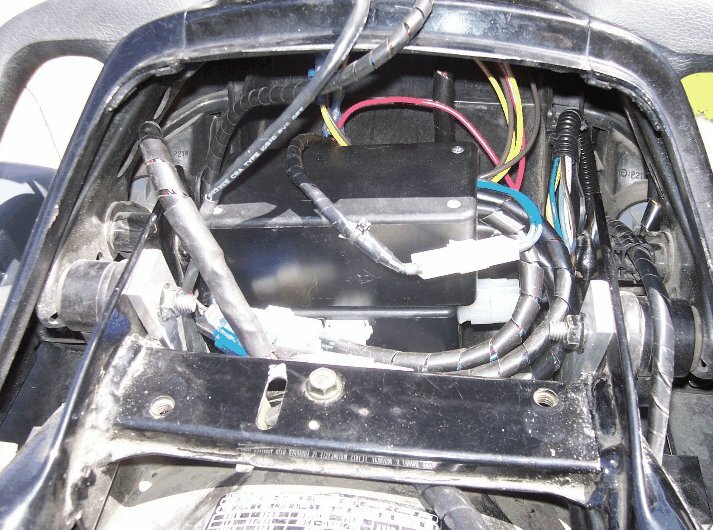 The 3 loose wires are for the turn and brake signal triggers. I used a Radio Shack project box to hold it all (5"x2.5"x2"). I cut a notch for each of the connectors and the trigger wires to go through. This is how it all fits in the box. Here it is all closed up and ready to be plugged into the bike under the seat. The relay for my isolated power panel sits next to the battery just under the factory fuse box and has 2 output pins. I am only using one of those for my power panel so I will use the other pin for this project. Comments: Oh sure, now you decide you don't need to fuse each circuit. I used your original plan so I am covered with three individual fuses. I made a box at work and it ended up being a cube about 3.5" Works great Bob, thanks. The EC trailer harness has a fuse at every input (2) and output (4), and another brand harness/kit does also (don't remember the name). But I saved a bunch making it myself so I guess not too lazy. I didn't think it would really matter for me as long as the main fuse is there on the input side of it. Having the extra fuses is kind of like having left side-right side zone heating in your car. OOPS! a bit of oversight - I didn't make sure having connectors out both ends would actually fit in the space intended under the seat. Didn't think it was that tight. It is, and it doesn't fit that way. So I moved the power connector on the box to the side and glued the cutout piece in the old hole to plug it. This fits much better. Plenty of room inside the box to move the wires around and this allows the power cable to have a little more slack also. Here is the rear storage space under the seat. It is pretty full now with full sized relays and the project boxes to hold them. I didn't want to use this space for anything else anyway. 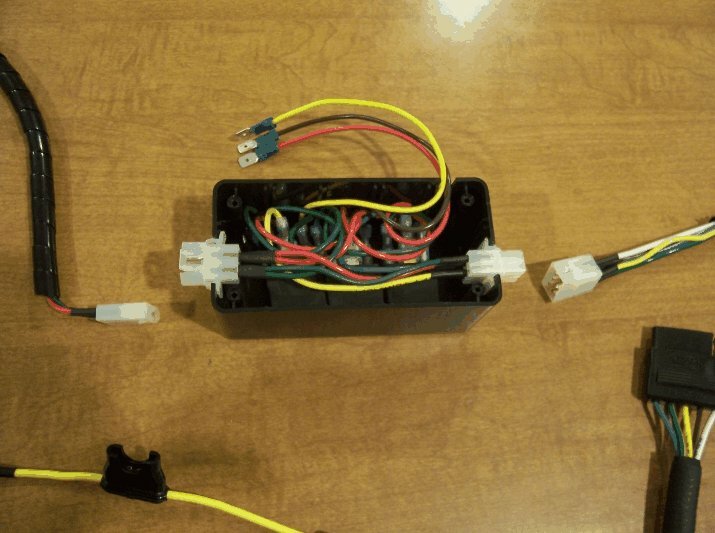 The upper box holds the relays for brake-left turn-right turn signals and the running light pass through wire for the LED strips on the back of the bike and in the top case. The many cables from this box are for each of the LED modules. They are joined inside the box. The lower box holds the relays for the trailer lights. I ran a separate power wire for this since I wanted to cover non-LED lights on a trailer if needed. Otherwise I could have tapped off the wires in the first box. This photo shows the trailer final cable installed. I can unplug it from the relay box and stow it in the storage space when not pulling a trailer. I feed it up under the plastic just behind the saddle bag slider frame and into where the relay box is. I use velcro straps to tie it to the back of the hitch hanger and hitch frame as shown. It has to be on the back of the hanger to avoid contact with the saddle bag. 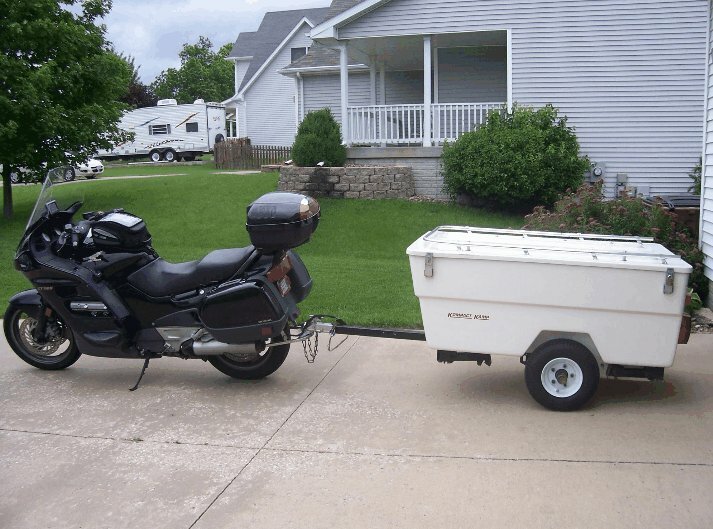 I guess it's hard to see with the angle of this photo but the saddle bag does not contact the trailer cable at all. The cable is also out of the way when the saddle bag is removed or installed. The maiden voyage of camper hitched to the bike on the way to LOC-STOC went very well. There was an uncomfortable intermittent wiggle on the highway for the first part of the trip but that turned out to be primarily due to high winds (gusts to 35+ mph) in central Iowa and made worse when the big rigs would pass with all the high wind induced turbulence. This wiggle settled down as the wind died down a little (gusts only to 20+ mph). The first 50 miles were getting my "towing legs" back from when I towed a much heavier camper with my Wing years ago. 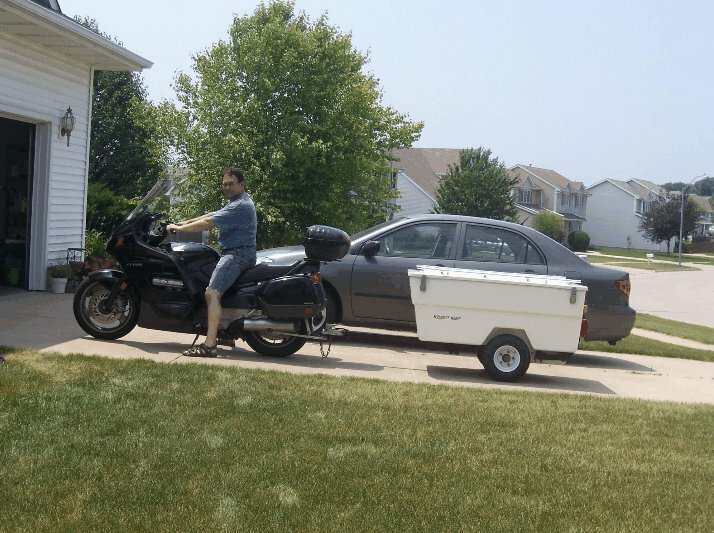 After that I had no problems pulling the camper and settled into the "normal towing mode" for a bike with camper in tow. My DenRay hitch didn't wiggle nearly as much going home from LOC-STOC as it did going. Wind was much less going home. I did decide I need to lower the hitch to bring it more parallel to the ground rather than raise the trailer tongue. 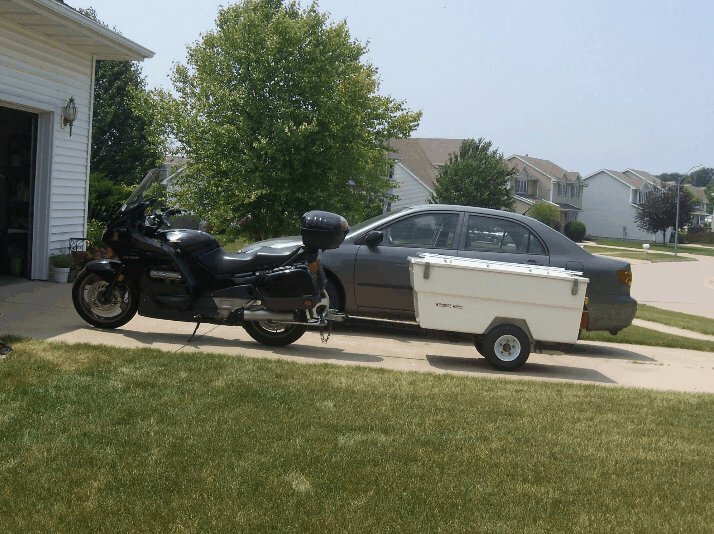 In any case the trailer was sitting very nose-high on the bike. I measured the hitch on my cage and found it was lower than the hitch on my ST! (major influence on that decision). The hangers are made of 1/4" x 1" x 4 ft aluminum bar that was cut in half, making the 2 hangers. I had cut 3" off the length of the hangers I used initially. Went to Lowe's and picked up another bar and intend to leave the hangers at 24" each rather than 21". I really didn't think the hitch was that high, in fact it was lower than other's hitches I compared to at LOC-STOC. But it is higher than my former GW hitch was and about 3" higher than the camper requires to be level. I should still have plenty of clearance to the road after the drop with the exception of one or two VERY steep driveways I remember from times past. I remember even the cage with an average height bumper would drag on those if taken straight on. Will report back when that is done. Thought I'd throw in one photo showing the problem. Looking closely at the hitch and tongue you can see that the hitch is angled up to the coupler and so is the tongue. It's a little more than appears in this shot and still not too bad but the front of the camper is high enough to block some of the view directly behind in my mirrors. I have determined that if the front were to be lowered even with the back that the view would be vastly improved. It also effects the dynamics of how the trailer handles in stop and go situations if the tongue is up, down, or level. Level is best. Here is the result. I lowered the hitch just a touch more than 2 inches at the ball. I replaced the hangers I made with new ones (too bad I can't add back on what I cut off) that were just over 1.5 inches longer resulting in the desired effect at the ball. I think this will be much better. I plan to hook up and drag the camper around the block or so when it's not so hot here to test that but I do have confidence this is where it needs to be. Not to worry - I don't ride dressed like this, I was only holding the bike up straight to see how the camper sat with weight on the bike. 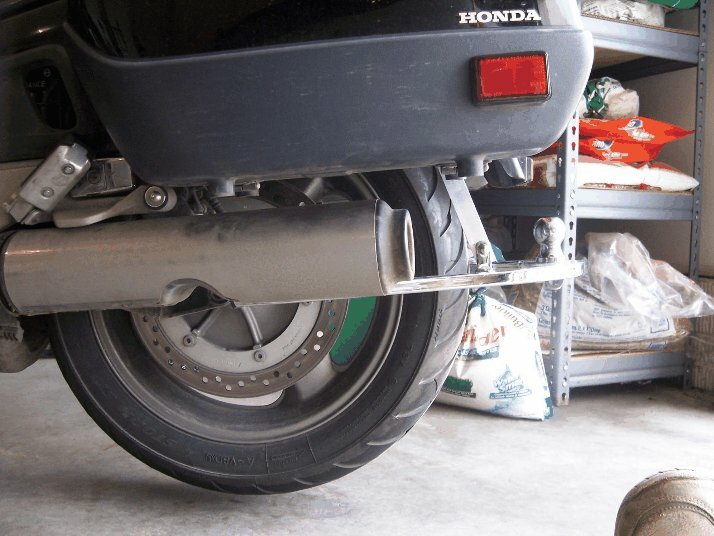 Sitting on the bike does drop the hitch down by 1 inch to 1.5 inches. Trailer looks to me to be the right level. I ride ATGATT. 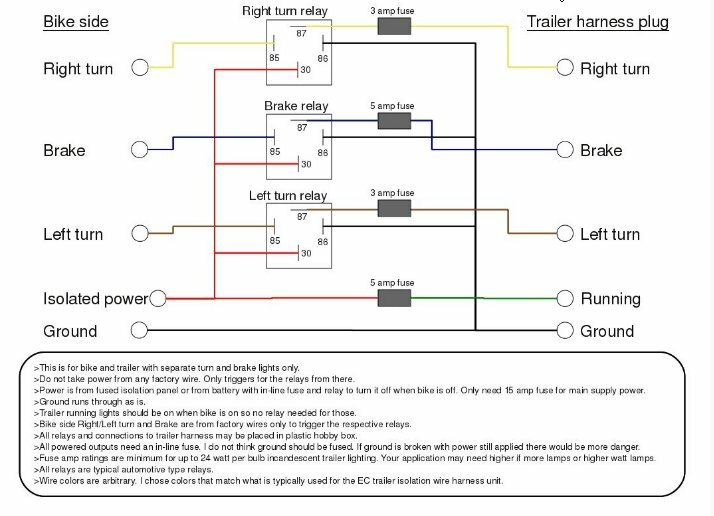 Attached here is the wire diagram that I use when I build my own wire harness for a trailer using standard automotive relays (3) for a 5 wire trailer hook up. I only actually tap the bike turn and brake light wires to trigger the relays and do not touch the bike running light wires. Power on my bike comes from a fused isolation power panel I added that is only powered when the bike is turned on. This is an alternative to the wire harness from EC or any other vendor if you are handy doing your own wire work. You decide if you crimp or solder your wire connections. I prefer to solder mine. Correction: I used to solder all my connections but in my old age I am getting lazy. I have lately been crimping the spade connectors for the relays and lathering the wire in dielectric grease. The crimp spade connectors are good ones and hold well. If I find a problem with any of these I will go back and solder them. But so far they have held up well. I still solder any other connections I make including splices and the connector pins and cover with heat shrink insulation.